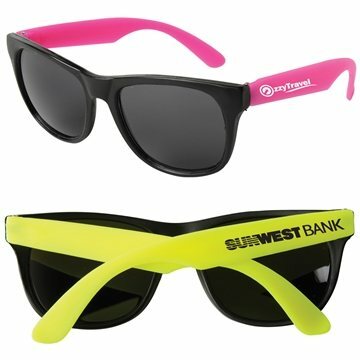 Features brightly colored neon or black temples with a black frame. Ultraviolet-protective lenses with UV 400 rating to protect your eyes from the bright sun. the products looked much better in real life. Thanks! It is fine. No problem with the product at all. Our audience were raving about them. They're useful, eye catching, and get our website name out there to many people. this way we can see how it works out. Quality and price Our Citizen Corp Board was quite happy with this item. Everybody at work loves the product.